It was a dark night. 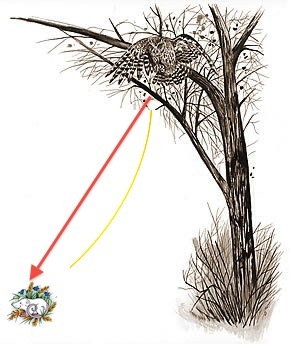 Hedwig, the owl, was sitting up on the branch of a tree when he spotted a mouse on the ground. He swoops down silently to catch the mouse. Owls can be really silent when they just glide down. What path should he take to reach the mouse? Should it be a straight line? Or a curve? What curve? It turns out, that Hedwig the owl should follow a curve called "Cycloid" to reach the mouse the fastest. Birds also tend to take this path when they glide short distances from branch to branch. There is one more interesting property of a cycloid. If a smooth slide is made into the shape of a cycloid, no matter at what point you jump on to the slide, you'll take the same amount of time to reach the bottom. Isn't that interesting? Cycloid is the path a point on circle takes when it rolls on a surface. It looks simple, but has many variations. When we roll the circle over another circle, instead of a straight line, we get a much cooler looking Epicycloid. And if the circle moves around the inner circumference, rather than the outer circumference, we get a Hypocycloid. Requires Java permissions to run. Play around with the sliders above. Can you get the cycloid to trace a straight line? It happens when the small circle is just half the radius of the large circle and is moving inside the large circle. If you observe a point inside the circle, rather than one on the circumference, it appears to move slightly differently. That's called a Trochoid. So we can have Epitrochoids and Hypotrochoids from such points. Actually cycloids are a special type of trochoid where the point is right on the edge of the circle. Below is an application that you can play around with and create some interesting shapes using cycloids. It needs Java permissions to run. Your browser should be asking for it. Very interesting Math Wizard.....keep finding more solutions. Even someone like me in a permanent dread of Mathematics could follow it. Smart post. @umashankar Thanks. Glad that you liked this! To tell the truth, even I dread maths. ;) So I decided to just enjoy and have fun with it, instead of trying to 'learn' it. @sriramnivas Thanks for the encouragement!